Great for Greeting Trick-Or-Treats, or visitors to your haunted house, Hang on your door, a tree, your porch, or in Your Living Room. Ideal prop decor for Halloween party, spooky haunted house, bars, nightclub, adding strong Halloween atmosphere. 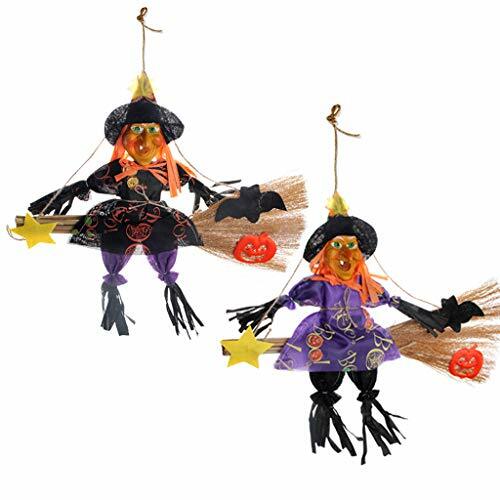 Hanging ornament with ropes and scarecrow broom decor is stylish and adorable for Halloween decoration. Made of high quality material, exquisite workmanship, lightweight and durable for use, nice Halloween gift. It's 35cm/13.8 inch tall, 40cm/15.8 inch wide (approximately), Lightweight, perfect Halloween scary hanging witch decorations holiday season decor. If you have any questions about this product by IFOYO, contact us by completing and submitting the form below. If you are looking for a specif part number, please include it with your message.